What is a Specification Sheet in Fashion? A garment specification sheet is a technical document that contains the construction details of the product, a technical diagram/ sketch of the garment, measurements of the product. Here fashion is referred to the apparel and clothing products. The fashion designer communicates the design concept through the specification sheet. The stitch class and seam type are mentioned in the sketch. The diagram also communicates different measuring points by English letter (symbol). To make the garment pattern, grading of the patterns for different sizes, developing a sample and sourcing of the materials, the spec sheet is followed. The initial specification sheet is made for developing proto sample. Later the specification sheet (measurement chart) may be revised after checking the sample FIT and garment construction. In the sampling stage, the quality inspector and buyer QA follow the instruction in the specification for the sample checking and sample approval. At each stage of sample approval, buyer adds comments of the specification sheet (tech pack). All the comments on the sample and modifications on workmanship and material are incorporated in the next sample development and bulk production. In the bulk production, the revised and approved garment specification sheet is referred for internal quality checking and the final shipment inspection. The specification sheet also coined as spec sheet. The specification is part of an apparel tech pack though many uses both the term interchangeably. 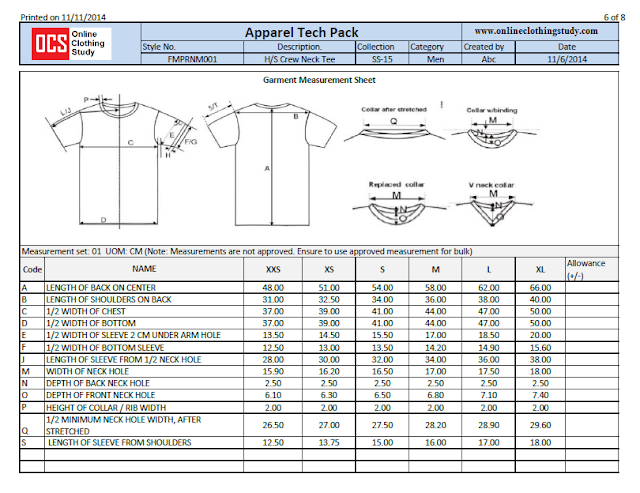 A measurement sheet and garment diagram are shown in the following image. Also see: What is garment spec sheet? Online Clothing Study: What is a Specification Sheet in Fashion? 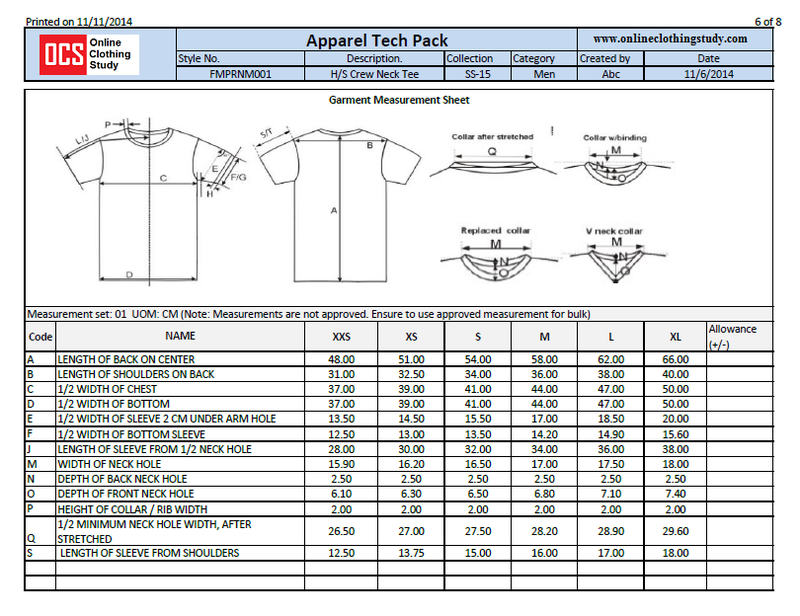 A garment specification sheet, garment techpack for fashion products.